The man bag didn’t gain notoriety until recent times. Sure, there were briefcases, messenger bags and backpacks designed with masculine silhouettes aimed at C-suite executives and globetrotters. But how often do you see men carry bags for a casual stroll around town? Maybe not much in the past, but with the increase in millennial’s spending power, luxury fashion houses are targeting the accessory market by designing covetable bags for men. We’re not talking solely about plain carriers that come in all black. Virgil Abloh at Louis Vuitton, for example, gave his signature streetwear twist to the timeless Keepall Monogram Bandoulière in his debut collection. Kim Jones did something similar too at Dior Men’s, breathing new life into the Dior Saddle bag (reserved in the past for womenswear) and making it one of this season’s hottest bags. In case you were in the mood for a bit of shopping on your own, what better way to start than making your first purchase of the season a man bag for yourself? For the ladies reading this, your man/partner will surely appreciate you shopping for him in a role reversal. Most of us should be familiar with the iconic silhouette of Louis Vuitton’s Keepall Monogram Bandoulière (it was also one of our must-have duffel bags of 2018). However, that was before Virgil Abloh was appointed as creative director for the Parisian fashion house’s menswear line. For his debut Spring 2019 collection, he injected his signature streetwear flair into the heritage of Louis Vuitton, and in it birthed one of this season’s hottest accessories. Make no mistake, Abloh didn’t just give us one update to the Keepall: he gave us an option for every day of the week, including two transparent makes. Why would you carry a keepall every day, that’s your prerogative. Perhaps to flex your hypebeast game and the fact that you can cop even one, let alone all seven. Logos these days are not set in stone (just look at all the sans serif typefaces these days). So Prada jumped on the logomania bandwagon and designed in collaboration with Rem Koolhaas’ studio OMA over a dozen new naval-inspired interpretations of the Prada logo for their Spring 2019 campaign. And lucky you, some of them are patterned in a neat grid on the Prada Brique shoulder bags. Crafted from classic Saffiano leather, the Brique comes in two shades of blue and features a variety of the whale Prada motif. If you’re into the whole maritime theme, there are also other leather goods from the Italian fashion house in this same style. Get yourself a bag as versatile as the Givenchy Tag. When slung across your body, it has a sleek, stealthy profile that looks refined. But grab it by the handle at the base of the bag, clutch it against your body, and you have a statement accessory that declares your love for all things street. 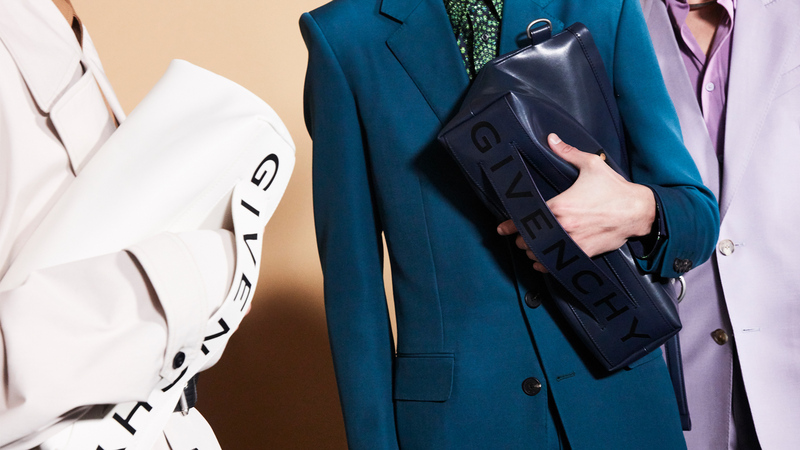 The Tag comes in three colours: black, white, and blue, with the Givenchy logo more prominent on the former two. Not every day calls for a full-sized bag, which is why the trusty pouch was invented. Our pick for this category is the Dior x Kaws Bee pouch, released this season as part of Kim Jones’ inaugural collection for Dior Men’s (yes, they dropped the Homme post Kris van Assche). These pouches are not your run-off-the-mill designs. They are the culmination of two of streetwear’s most revered minds: Jones and Kaws, also known as Brian Donnelly. The bees that have been embroidered on the black soft leather come in either yellow or pink (the main colour for Dior Men’s Summer 2019 collection). Remember when fanny packs were a thing? Yeah, they’ve never really gone away from the waists of men all around the world, especially not when Riccardo Tisci made a statement with the bum bag in his debut collection for Burberry’s Spring/Summer 2019 season. Don’t worry, you won’t look half as clueless as the hordes of tourists who wear their fanny packs with naiveté. Tisci’s version of the bum bag is chic and utilitarian with its bold, striking patterns (there is also another version in an almost-leopard print). The fanny pack (and the entire SS19 collection) is set to drop in stores and on the Burberry website come 27 February. Flashy bags are great, but you’d still need a proper briefcase for your day-to-day business needs. Enter Berluti, a storied leather specialist that crafts only with the finest Venezia leather. In their Spring 2019 collection, they introduced the Un Jour Mini, a briefcase that bears the same profile as the larger Un Jour, but made more compact. Despite its smaller frame, it can still snugly hold a 15-inch laptop and your documents. Its exterior is also far from the typical black briefcase designs. The brown patina, a signature of Berluti, is contrasted with the ivory Scritto motif on one side of the briefcase. This asymmetry creates such strong imagery that will impress even your usually-stoic boss. That is if you’re not already the boss of your company. This article was first published on LifestyleAsia.